We represent client’s in mediation and arbitrations involving breach of contracts, business disputes, and other business issues prior to litigation. 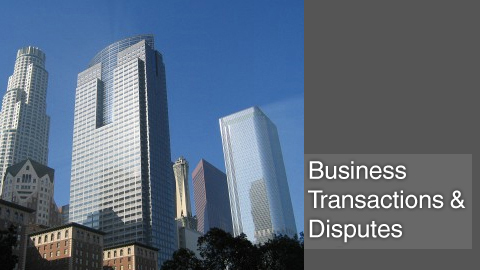 Our business litigation attorneys can handle complex business matters involving but not limited to breach of contract, shareholder disputes, commercial real estate disputes, partnership disputes, collections, and unfair trade practices. Lavaee Law Group can offer invaluable counsel regarding a business start-up. We have former business consultants on staff who can not only help a client draft a business plan but advise a client on the proper business entity to be use. We represent clients in business law transactions and will draft all our client’s legal documents, including but not limited to, employment contracts, loan agreements, promissory notes, pledge agreements, franchise agreements, subscription agreements, buy/sell agreements, purchase contracts, independent contractor agreements, and corporate formation documents. Our attorneys handle basic to complex purchase and sale agreements for purchasers and sellers of businesses. Whether it is an asset only or a corporate stock purchase, we can protect your interests. To get started with a free and confidential consultation, please contact our office toll free or via email to speak with a business transaction attorney in Beverly Hills.